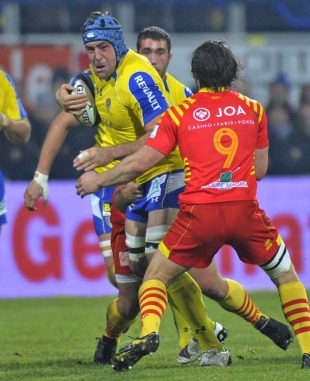 Clermont lock Jamie Cudmore is set for another spell on the sidelines after picking up a 40-day ban in the wake of his side's bruising Top 14 encounter with Perpignan. The Canadian international was handed his latest suspension after being found guilty of punching Perpignan's Grégory Le Corvec during the December 29 clash that Les Jaunards won 22-16 to bolster their push for the post season. The match at the Stade Marcel Michelin was Cudmore's first outing having served a 70-day ban for stamping on Saracens' Jacques Burger during their Heineken Cup clash in October. The 32-year-old was suspended by his club in the wake of his citing and sat out the league games with Bourgoin and Brive as well as last weekend's Heineken Cup victory over Racing Metro. Cudmore is also set to miss Clermont's European date with Saracens this weekend and a league meeting with Racing. He will be free to play again on February 8 ahead of a showdown with Top 14 title rivals Montpellier.